It was The Bert’s birthday on Friday – a low key affair, that was rounded off with a delicious meal in the evening. I couldn’t be bothered to cook, so instead bought a couple of the Charlie Bigham steak and ale pies from Waitrose. Ooh they were so scrumptious, served up with chips and green veg. I don’t know if it’s because our bellies were still digesting but we didn’t feel up to doing much on Saturday so had a very leisurely sort of day: a pootle around town in the morning, quite a lot of sitting, reading etc while Little Bert (everyone says our son is the spitting image of his dad!) had his nap, then a mooch around a village fete and then while The Bert did Little Bert’s dinner, a spot of hooky. I have a LOT of projects on the go, some started recently and some that have been waiting an age to get finished up. I really should be working on the pink and grey blanket, but I just fancied doing a quick and easy something that required little thought. So I rummaged through my basket and fished out the dishcloth I started a couple of months ago. It was my mum’s fault that I started the dishcloth. She had been in town during one of her visits to see me and popped into my local wool shop and got talking to the lovely ladies in there and came home with some handicraft cotton and instructions for knitting a dishcloth. 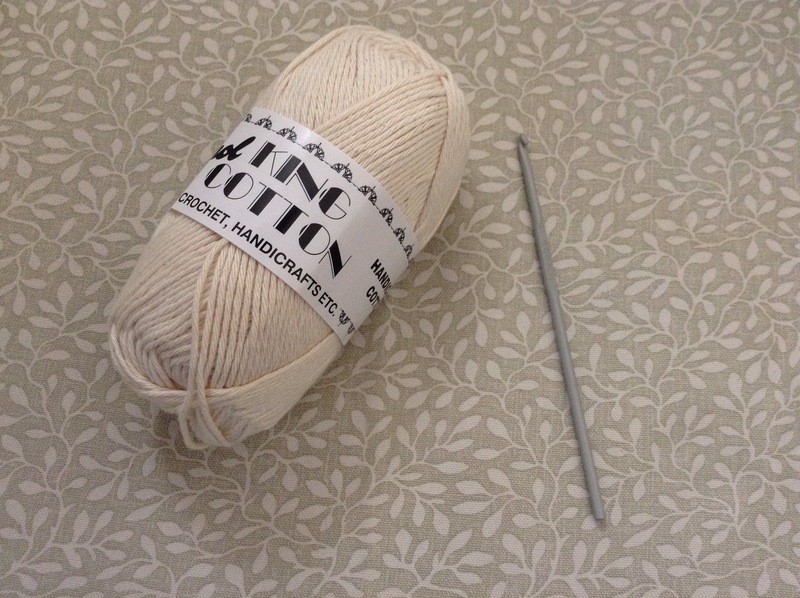 Well, of course I wanted to crochet one so went and bought my own yarn supplies. After a bit of looking on the internet, I found some lovely dishcloth patterns from Petals to Picot, and made a start on the Crunchy Stitch dishcloth pattern. 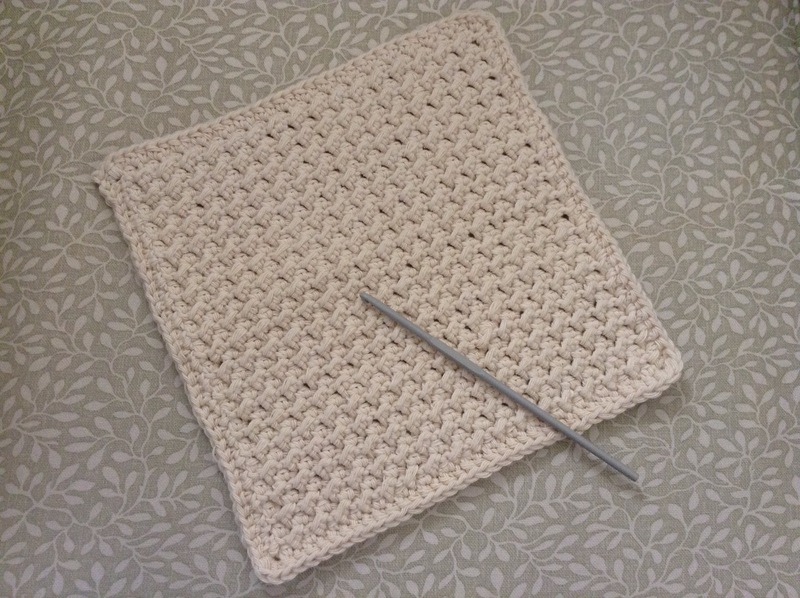 The pattern is really easy to follow and my final cloth measures 8.5″ square. I seem to remember I did a few more chains for the first row to make it this size. I really enjoyed making something that required little thought and was nice and repetitive, and didn’t take too long to complete. 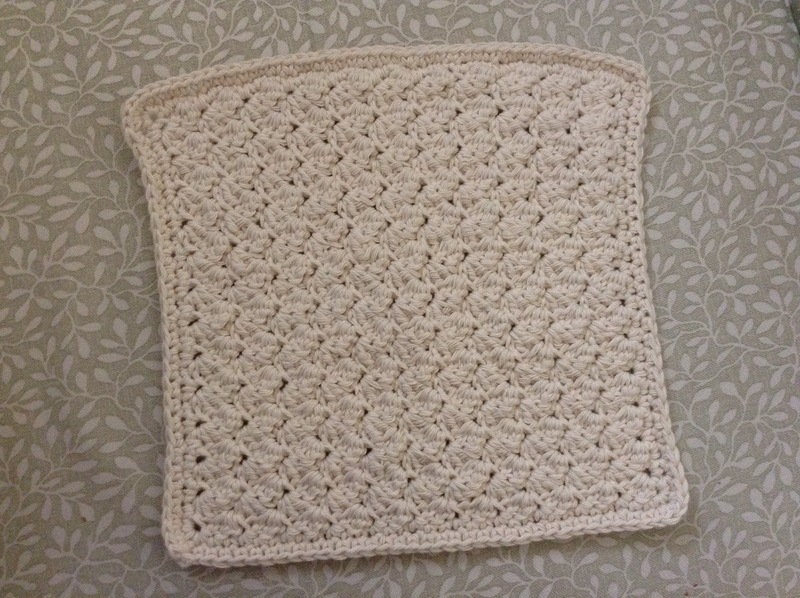 So I thought I’d try one of the other patterns: the textured crochet dishcloth. For some reason I found this one very hard to master. I wanted my cloths to be the same size and I must have unravelled and re-done the first couple of rows at least five times before it worked out ok and I was into a good rhythm. And then I ran out of yarn! Grrrrr! So, despite buying more cotton, the cloth has remained untouched in my basket for several months. But luckily I found it easy to pick up where I left off, joining in the new ball of yarn. There, did it. Although not sure what happened as it’s not exactly square. Looks a bit like a slice of toast. Anyway, really pleased with them both and now just have to bring myself to use them! I reckon with a different pattern you’d get two cloths out of one ball of cotton, so they’d work out £1 each, which isn’t too bad and I’m sure they’ll last a lot longer than bought cloths. Plus I had the enjoyment of making them. Today has been Father’s Day here in the UK, and we’ve had a nice family day. 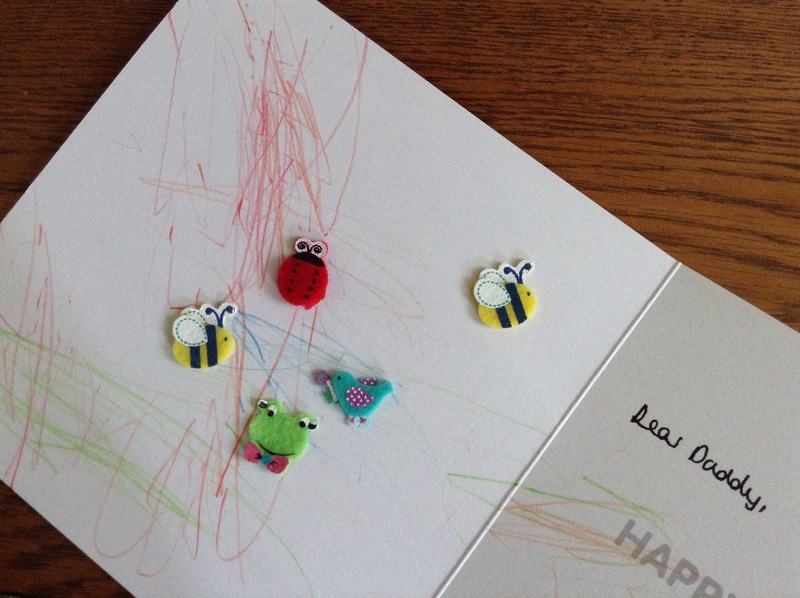 Little Bert and I were doing stickers and colouring in a card for The Bert at 7am this morning. LB is an early riser and usually up for the day at 5.15am… It’s exhausting but at least we were able to do something constructive with our early start today! 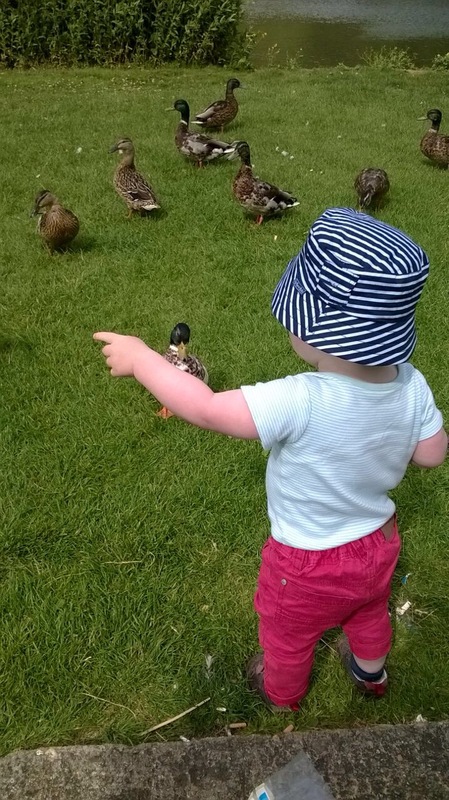 We enjoyed a Sunday lunch at a local pub and then this afternoon The Bert took Little Bert to the park to feed the ducks. He absolutely loves being outside and spotting things in nature and has a very keen eye, pointing out birds that I’d struggle to notice without his help. And he’s a brilliant mimic for animal sounds, copying with scary accuracy the sound of ducks, crows, dogs etc. I think that’s why he’s doing so well with his talking – he’s saying about 50 words now and able to join words together (e.g. 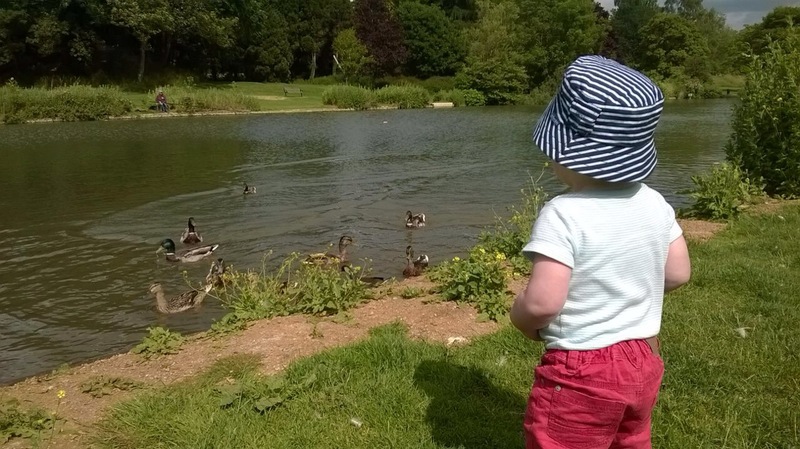 Daddy’s shoes, big bubbles) – again, something I’d never expected from a 15month old! I can’t believe how quickly he is growing up. Anyway, I hope that you’ve had a great weekend. 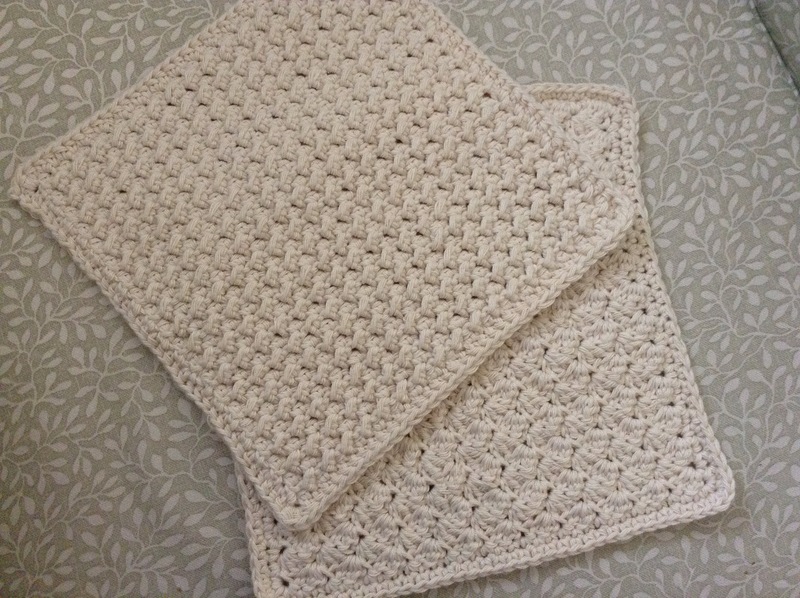 And do make some dishcloths if you fancy a mindless make… (If you have any other patterns for me to try, please share!). Hello! Thanks for visiting, it's lovely to see you! I'm Jones, I'm 31, and I live with my husband (The Bert) and chinchilla (JB) in Gloucestershire. When I'm not at work I love crochet, sewing, cooking, baking, taking photos and dabbling in a bit of gardening and grow-your-own, and this is what I write about mainly. That and the general chit chat of life. So, take a look around, comment if you'd like, just make yourself feel at home really! This entry was posted in crochet, family, General chit chat. Bookmark the permalink. AWWWW gorgeous photos of little Bert Jones. I seem to think I have some cotton yarn like that somewhere. Tempted to have a go at a dishcloth now. Thank you again for your sweet gifts . Just seen your comment on Attic24, then read your blog, hope life is ok, guess you don’t have time to blog nowadays with work, Little Bert and crochet. So many bloggers have dropped out I am trying, not too successfully to keep going with my blog, it acts as an old fastness diary to some extent, although my personal diaries didn’t have the restrictions that my blog has to have after some ghastly emails from someone who read it and reacted so badly that the fall out changed mine & DH’s lives. Still, no one can take offence at knitting and crochet I hope.